Language labs or classroom network set-ups are� undoubtedly the most complete method for language immersion available to students. Other methodologies such as online or blended learning language training are also very valuable in the development of languages but do not have the same advantages as a language laboratory. What are the advantages of a language lab? #1 Language labs allow students to learn while also having fun! Language labs offer an effective methodology designed exclusively for students of Secondary and Higher Education to learn a language in the classroom through complete immersion. Students have much more fun than in a traditional class when learn through multimedia exercises on a classroom computer. Interactive computer learning for networked classrooms encompasses a natural and progressive learning method where students learn different language concepts intuitively while using and practicing the language. This methodology helps students learn in an easy and entertaining way, improving their motivation for learning, and increasing language retention. The language laboratory plays an important role in the learning process. Setting up language labs may seem costly but it doesn’t have to be so. 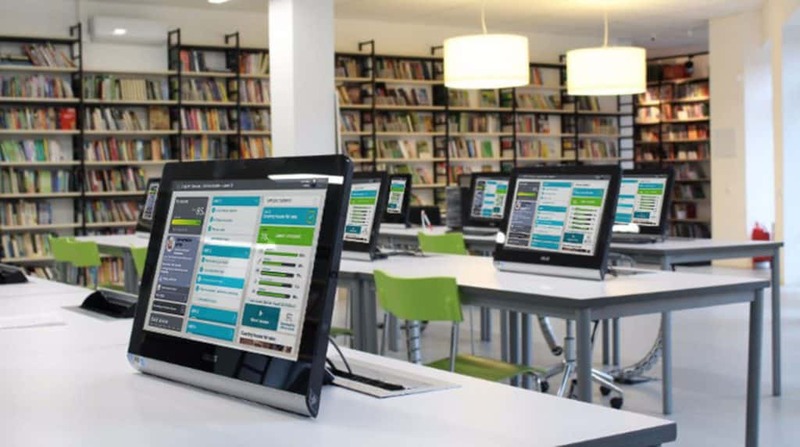 Most educational institutions already have existing computer labs that can be repurposed to also incorporate a language lab and leverage existing computer resources. In this way, it is possible to set up language labs at a very low–cost by using existing computers and networks without needing to buy any new hardware. Students can access the language courses from their computer labs from any computer in the network, that is, they don’t have to sit in the same computer every time. Headphones and microphones plugged in locally help the students interact and engage with the language course. Students can learn several languages all at once with this method. Language labs do not need internet to work, instead, the courses are installed on a local area network inside the classroom where internet connection is only required during installation and periodical system upgrades; making them the perfect tool for geographic areas where internet connection is weaker or slow. The digital environment the language laboratory provides is highly attractive to students. Traditional book learning in the classroom has become boring to students who come from a generation that is highly receptive to technology. Language labs are a technologically advanced approach to language learning that students can really identify with and therefore learn more easily. They interact with the target language through dynamic activities, a speech recognizer that evaluates pronunciation, reinforcement exercises customized for each student based on their needs, and more. Language labs are tools that facilitate the work of the language instructor as it gives them everything needed to give a fully structured and effective class for their students. The classes are much more practical in every way and from the host computer classroom the teacher can know in real time how their students are progressing. Both teachers and students have all the structured content to reach language development success. The courses for labs also include placement tests, progress tests, and a final evaluation of each of the language skills which allows the teacher to easily assess their students’ strengths and weaknesses. Language labs are self–guided and easy to follow resources for any student at any level. Instructors don’t have to be present in order for students to progress with the course. Language courses for networked classrooms do not require any previous training. The language laboratory is a very useful learning methodology for language development that allows students to learn with flexibility and at their own pace. Discover Dexway language labs now and see why international educational institutions around the world are already using it.